To speak to a live IRS professional regarding your issue, dial the IRS customer service phone number listed above. Note: if you need to check the status of your refund, file a form, get a tax transcript and many other services, its BEST to do it online at www.irs.gov/refunds. It will save you a lot of time and aggravation, as talking to a live representative will be very time consuming. Please note that during tax season (January to April) the wait times will be very long. Expect to be on the phone for at least 40 minutes to 1 hour! 6. Full name, date of birth and social security number of any dependent on your tax return you are calling about it. If you are calling on someone else’s behalf, an IRS representative will only speak with you if you can present proof of being a LEGALLY designated representative of the person you are calling about. If you feel that your issue has not been successfully resolved offer the phone, you can get face-to-face assistance from your local IRS Advocacy Office. Select your state, and you will see a list of local offices in the drop down menu. 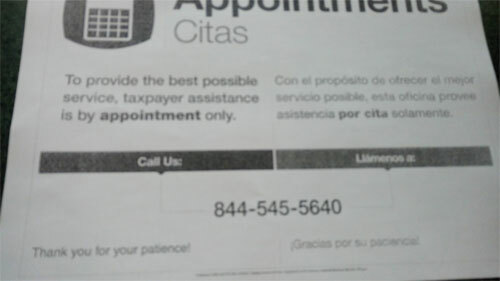 Picture of Appointment card I took in March 2016, at Boston IRS office. Believe it or not – you can actually walk into IRS local office and meet at a “tax professional” who can usually answer most of your question – both personal and business related. You need to set an appointment to meet with live person! I’ve don’t this myself – for my mortgage approval, I needed to file my taxes fast, and get them stamped by IRS. So I just brought my printouts to the IRS office in downtown Boston. IRS stands for Internal Revenue Service. It is the revenue service of the United Stated Federal government is the bureau of the Department of Treasury. The IRS is responsible for collecting taxes and administering the Internal Revenue Code.